Bolly Gupshup from Subhash K Jha. Anil Kapoor has a new role to play. Bollywood's Peter Pan is now playing father-in-law to his elder daughter Sonam's husband, Anand Ahuja. So how does it feel being a father-in-law? "What father-in-law?" asks the 61 year old, who is more energetic than his son Harshvardhan and nephews Arjun, Akshay and Mohit (and dare we say Jahan). "From the beginning, I made it very clear to Anand that I was going to be his friend, not his father-in-law. So the ice melted even before it was frozen." "Anand was a part of our family for a very long time. We are pals first, relatives later." Anil and his daughters Sonam and Rhea have more reason to rejoice as their home production, Veere Di Wedding, is a huge success. "More than me, this is good news for our production company," he says. "A successful film means all of us -- my daughters Rhea and Sonam and me -- are on the right track as film producers." There has been a lot of raised eyebrows about the language and the sexual content in the film. "A lot of it was censored," he says. "The language we have is what is permissible as per the censor rules and the Constitution. We opted for an 'A' certificate. Adults do speak in that way, whether we like it or not." "Honestly, when I heard the script, the language didn't even seem like an issue. The dialogues went with the flavour and mood of the film." Anil is happy that Sonam has broken the myth about married actresses facing a career slump. "This is such an old fashioned way of looking at an actor's career," he says. "I don't think anyone becomes less popular because he or she is married." "When I married Sunita in 1984, I was told my popularity would wane. I was determined to prove the cynics wrong. In fact, my actual success as an actor started after marriage." It has been reported that Sanjay Leela Bhansali is working with various A-list stars. One report suggests that Hrithik Roshan met Bhansali for a proposed film. Elsewhere, Salman has gone on record during the promotion of Race 3 to state that he will be doing another film with his Hum Dil De Chuke Sanam director. 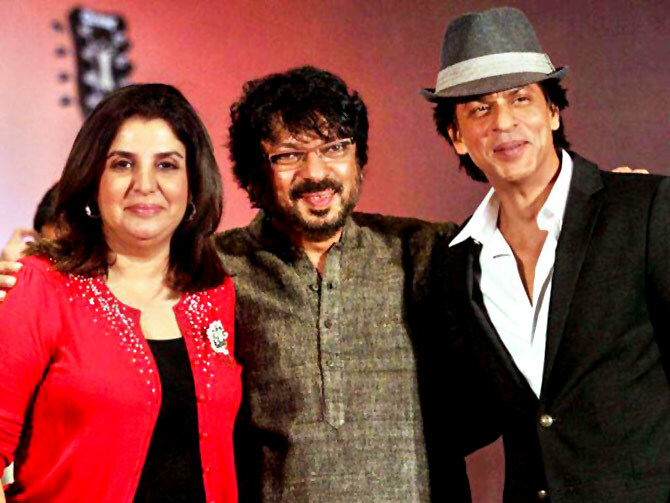 Shah Rukh Khan has also been seen in his Devdas director's company. Sources close to the director reveal that there is no project with these three A-listers. "Sanjay Bhansali hasn't even decided what he's directing next. Right now, he's busy producing his niece Sharmin's film," says the source. Marathi Director Mangesh Hadawale -- whose unreleased film Dekh Indian Circus has Nawazuddin Siddiqui in his career's best performance -- will direct Sharmin and Jaaved Jaaferi's son Mizaan in a love story that, according to sources, will go beyond the boy-meets-girl trope. While Mizaan is undergoing rigorous training to prepare for his part, Sharmin has attended acting school in New York. Her mother Bela Sehgal -- Bhansali's sister -- has edited many of her brother's movies and also directed the Boman Irani-Farah Khan comedy Shirin Farhad Ki Toh Nikal Padi. Sharmin's paternal grandfather Mohan Segal was a well-known film-maker of the 1970s, who introduced Rekha to the screen in Sawan Bhadon. The producers of Shankar's 2.0 -- starring Rajinikanth and Akshay Kumar -- are facing a budget crisis. "Originally, 2.0's budget was Rs 65 crore (Rs 650 millionRs 900 million), keeping in mind the expensive special effects. But the budget has gone up to Rs 160 crore (Rs 1.6 billion), which would be impossible to recover for a Tamil film," says a source close to the project. "Rajinikanth is God in the south, but in the north, he has no market," adds the source. "For the Hindi belt, the producers are hoping to get Akshay Kumar to promote the film, but he plays the antagonist." "But for all of this to be considered, the film first needs to be completed."